RespireRx Pharmaceuticals Inc. (the “Company”) has prepared a platform summary and an executive summary with respect to each of its two development platforms, Ampakines and Cannabinoids. The Cannabinoid Platform Summary describes the Company”s Dronabinol program. The Ampakine Platform Summary describes the Company”s CX1739, CX717 and CX1942 programs. Each platform summary is a very short overview of the platform, including a brief background section and a brief discussion of recent developments. Each executive summary is a more extensive discussion of the respective platform, its related programs and potential applications, including substantially more detailed scientific information. In addition, the Company has prepared a short Financial Summary that summarizes certain recent market metrics and financial statement information, which financial statement information was drawn from the Company”s annual report on Form 10-K for the year ended December 31, 2016 and its quarterly report on Form 10-Q for the period ended March 31, 2017. Both platform summaries, both executive summaries and the Financial Summary are attached as exhibits to this Current Report on Form 8-K.
RespireRx is developing a class of proprietary CNS-acting compounds known as ampakines, which are allosteric modulators of the alpha-amino-3-hydroxy-5-methyl-4-isoxazolepropionic acid (AMPA) receptor. 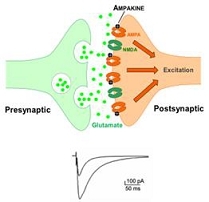 Ampakines enhance the excitatory actions of the neurotransmitter, glutamate at the AMPA receptor complex, which mediates most excitatory transmission in the CNS. Through an extensive translational research effort from the neuronal level through Phase 2 clinical trials, the company has developed a family of “Low Impact” Ampakines, including CX717, CX1739 and CX1942 that have clinical application in the treatment of CNS-driven respiratory disorders, behavioral disorders, spinal cord injury, neurological diseases, and orphan indications. In confirmation of previous clinical trials with CX717, CX1739 has been shown in a recent Phase 2a study to antagonize the respiratory depression caused by remifentanyl, a very potent opioid, without blocking its analgesic effects. These study results confirm target engagement of AMPA receptors and provide proof-of-concept clinical data to support the development of CX1739 for the treatment of various manifestations of OIRD, including opioid over-dose, central sleep apnea (CSA) and the management of post-operative pain. OIRD often presents as CSA, which is caused by chronic opioid use, with an estimated prevalence of 5 – 6 MM patients. With no approved drugs or devices to treat opioid induced CSA, this market is attractive for the continued development of CX1739. RespireRx is prepared to initiate Phase 2 protocols for OIRD and CSA. CX717 has been shown to improve breathing and promote motor function in a rat model of SCI, for which there is significant need for additional treatments to improve respiratory & motor function. Both CX717 and CX1739 have potential utility in the treatment and management of SCI to enhance respiration, potentiate motor function for rehabilitation, and improve the quality of life for SCI patients. RespireRx is working with researchers at the University of Florida, University of Miami and the Detroit VA to prepare a Phase 2 protocol in SCI. RespireRx has completed a Phase 2 clinical trial with CX717 in ADHD, with statistically significant positive results. CX717 represents a breakthrough opportunity to develop a non-stimulating therapeutic for ADHD. RespireRx is working with researchers at NYU Langone Medical Center to continue the CX717 ADHD development program. Early stage research on ampakines has demonstrated that CX717 and CX1739 can improve respiratory function in animal models of orphan disorders, such as Pompé Disease, Autism Spectrum Disorders including Fragile X Syndrome, and perinatal respiratory distress. The company is actively working with experts and noted centers of excellence for the treatment of these rare disorders to bring new therapies to the clinic. RespireRx is developing a pipeline of new drug products based on our broad patent portfolios for two drug platforms: the cannabinoids, including dronabinol (D9-THC), and the ampakines, which allosterically and positively modulate AMPA-type glutamate receptors to promote neuronal function. We are a leader in the development of drugs for respiratory disorders caused by disruptions of neural signaling, with a focus on sleep apneas, opioid-induced respiratory depression, and other CNS-driven breathing disorders. Additionally, we are developing new drugs and formulations that address the widespread problem of opioid overdose. RespireRx has an extensive patent portfolio, with intellectual property for composition of matter and use across multiple indications. Special Note Regarding Forward-Looking Statements: Certain statements included or incorporated by reference in this Platform Summary, including information as to the future financial or operating performance of the Company and its drug development programs, constitute forward-looking statements. The words "believe," "expect," "anticipate," "contemplate," "target," "plan," "intend," "continue," "budget," "estimate," "may," "schedule" and similar expressions identify forward-looking statements. Forward-looking statements include, among other things, statements regarding future plans, targets, estimates and assumptions. Forward-looking statements are necessarily based upon a number of estimates and assumptions that, while considered reasonable by the Company, are inherently subject to significant business, economic and competitive uncertainties and contingencies. Many factors could cause the Company's actual results to differ materially from those expressed or implied in any forward-looking statements made by, or on behalf of, the Company. Due to these various risks and uncertainties, actual events may differ materially from current expectations. Investors are cautioned that forward-looking statements are not guarantees of future performance and, accordingly, investors are cautioned not to put undue reliance on forward-looking statements due to the inherent uncertainty therein. Forward-looking statements are made as of the date of this news release and the Company disclaims any intent or obligation to update publicly such forward-looking statements, whether as a result of new information, future events or results or otherwise. OSA, the most common form of sleep-related breathing disorders, is a serious respiratory disorder that involves repetitive cessation of breathing during sleep. It is estimated that up to 30 million people in the United States suffer from OSA, which has been linked to increased risk for hypertension, heart failure, depression, and diabetes. According to the American Academy of Sleep Medicine, the annual economic cost of OSA in the U.S. was $162 Billion in 2015. The current standard of care for OSA, continuous positive airway pressure (CPAP), involves a mechanical device that has poor patient compliance, adherence, and satisfaction. Despite these shortcomings, the sleep apnea devices market size is projected to exceed $8.7 billion by 2023 (Global Market Insights, 2017). There are no approved drug treatments for OSAS, and 80% of patients (23.5 million) are undiagnosed. Dronabinol (D9-THC) is a generic, orally active cannabinoid that that has been shown to act at CB1 & CB2 receptors on neurons to stabilize respiratory patterns and augment upper airway muscles. Two Phase 2 clinical trials have been completed and both have demonstrated significant reductions in sleep apnea produced by dronabinol. The results of the first, a Phase 2a study conducted by the company, have been published in two peer-reviewed journal articles, and the results from the recently completed Phase 2b study of dronabinol in OSA are in press. The PACE Trial was fully-funded by NIH through a $5 million grant. The results of the PACE Trial show that 2.5 and 10-mg doses of dronabinol produce statistically significant improvement in the primary endpoints, including improvement in the Apnea-Hypopnea Index (p=.001), sleepiness, as measured by the Epworth Scale (p<.02), and patient satisfaction (p=.04). The figure below illustrates how the PACE Trial replicated the statistically significant primary endpoint results of the Phase 2a study. Through an extensive series of translational research projects from the cellular level through proof-of-concept clinical trials, research has demonstrated that dronabinol is an effective drug therapy for the widespread and underappreciated disease, OSA. Special Note Regarding Forward-Looking Statements: Certain statements included or incorporated by reference in this Platform Summary, including information as to the future financial or operating performance of the Company and its drug development programs, constitute forward-looking statements. The words “believe,” “expect,” “anticipate,” “contemplate,” “target,” “plan,” “intend,” “continue,” “budget,” “estimate,” “may,” “schedule” and similar expressions identify forward-looking statements. 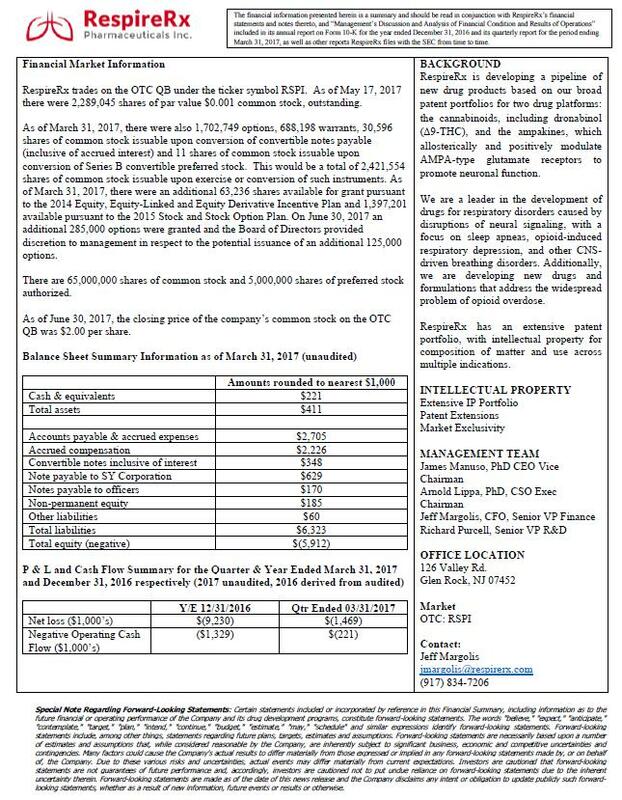 Forward-looking statements include, among other things, statements regarding future plans, targets, estimates and assumptions. Forward-looking statements are necessarily based upon a number of estimates and assumptions that, while considered reasonable by the Company, are inherently subject to significant business, economic and competitive uncertainties and contingencies. Many factors could cause the Company’s actual results to differ materially from those expressed or implied in any forward-looking statements made by, or on behalf of, the Company. Due to these various risks and uncertainties, actual events may differ materially from current expectations. Investors are cautioned that forward-looking statements are not guarantees of future performance and, accordingly, investors are cautioned not to put undue reliance on forward-looking statements due to the inherent uncertainty therein. Forward-looking statements are made as of the date of this news release and the Company disclaims any intent or obligation to update publicly such forward-looking statements, whether as a result of new information, future events or results or otherwise. The primary mission of RespireRx Pharmaceuticals is to develop innovative and revolutionary treatments to combat respiratory diseases caused by disruption of neuronal signaling. We are addressing respiratory conditions that affect millions of people, but for which there are few treatment options and no drug therapies, including sleep apneas - both Obstructive (OSA), and Central (CSA), opioid induced apnea and overdose, and disordered breathing from spinal cord injury (SCI) and neural dysfunction. RespireRx is developing a pipeline of new drug products based on our broad patent portfolios for two drug platforms, including dronabinol (D-9THC), and the Ampakines, which positively modulate AMPA-type glutamate receptors to promote neuronal function. RespireRx is developing a class of proprietary compounds known as ampakines, a term used to designate their actions as positive allosteric modulators of the alpha-amino-3-hydroxy-5-methyl-4-isoxazolepropionic acid (AMPA) glutamate receptor. Ampakines are small molecule compounds that enhance the excitatory actions of the neurotransmitter, glutamate at the AMPA receptor complex, which mediates most excitatory transmission in the central nervous system (CNS). These drugs do not have agonistic or antagonistic properties but instead modulate the receptor rate constants for transmitter binding, channel opening, and desensitization (see Figure 1). Through an extensive translational research effort from the cellular level through Phase 2 clinical trials, the company has developed a family of ampakines, including CX717, CX1739 and CX1942 that have clinical application in the treatment of CNS-driven respiratory disorders, neurobehavioral disorders, spinal cord injury, neurological diseases, and orphan indications. In particular, we are addressing CNS-driven respiratory disorders that affect millions of people, but for which there are few treatment options and no drug therapies, including opioid induced respiratory disorders, such as apnea (transient cessation of breathing) or hypopnea (transient reduction in breathing). When these symptoms become severe, as in opioid overdose, they are the primary cause of opioid lethality. In addition, we are developing our ampakines for the treatment of disordered breathing and motor impairment resulting from spinal cord injury (SCI). RespireRx is committed to advancing the ampakines through the clinical and regulatory path to approval and commercialization. The opioid epidemic that claimed over 70,000 lives in our country last year demands that new solutions for opioid induced apnea be developed to ensure the public health. To this end, the company plans to conduct a series of clinical trials with CX1739, CX717, and CX1942 in the prevention, treatment, and management of opioid induced apnea. RespireRx will continue to work with our collaborators to advance the ampakines CX717 and CX1739 for the treatment of patients with spinal cord injury (SCI). Early preclinical research suggests that ampakines may improve not only respiratory, but also motor function in SCI patients, especially in conjunction with acute intermittent hypoxia (AIH). Additionally, RespireRx plans to continue clinical development of CX717 for the treatment of ADHD. There is a clear and significant medical need for new, non-stimulating ADHD drugs. With a positive Phase 2A study in ADHD completed, and with anticipated clearance from FDA following the demonstration that the previous safety concerns were unwarranted, CX717 is positioned to move into Phase 2B. RespireRx will continue the development of orphan disease research, which is currently being supported through non-dilutive, NIH funding. The researchers hope to complete the preclinical research in the first half of 2018, paving the way for clinical trials at the end of 2018. Glutamate, the major excitatory neurotransmitter in the nervous system, is ubiquitously present in over 50% of nervous system tissue. Glutamate receptors can be divided into two groups: 1. Ionotropic glutamate receptors (iGluRs), transmembrane proteins which form ion channel pores that, when glutamate binds to the receptor, open and allow the passage of cations, causing neuronal depolarization and subsequent biochemical signaling cascades; and 2. Metabotropic glutamate receptors (mGluRs) that directly activate a signaling cascade involving G proteins. iGluRs tend to be quicker in relaying information, but mGluRs are associated with a more prolonged stimulus. The three ionotropic glutamate receptors are defined by the classic pharmacological agonists used to activate these receptors: AMPA, NMDA and kainate. When released from presynaptic neurons, glutamate attaches to and rapidly dissociates from its binding site on the AMPA receptor, producing a brief neuronal depolarization that rapidly deactivates as part of the neuronal signaling process. The depolarization produced by AMPA receptor activation also removes a voltage sensitive Mg2+ ion block from the NMDA receptor allowing it to be activated by glutamate. Glutamate binding to AMPA receptor further activates downstream signal pathways involving growth factors and G-proteins, which in turn activate kinase cascades, all of which lead to synaptic plasticity. Translational research efforts have focused on a family of brainstem neurons in the pre-Bötzinger’s complex (pre-BötC) of the brainstem, which regulates respiratory drive. These pre-BötC neurons express a variety of neurotransmitter receptors, including AMPA glutamate and µ-opioid receptors. Using in situ brain slice preparations, local application of opioids reduces the electrical activity of these cells and their concomitant respiratory motor neurons. AMPA receptor activation increases respiratory motor neuron activity and AMPA receptor blockade reduces respiratory motor neuron activity. For these reasons, the study of respiratory rhythm and drive represents an ideal translational platform to study drugs that act at AMPA receptors. Target site engagement and proof of principle studies can be conducted from in vitro cellular, in situ organ and in vivo whole animal levels leading up to the human level. Since the elucidation of the molecular structure of the AMPA glutamate receptor and the discovery of two structurally distinct classes of compounds that could selectively potentiate the currents mediated by glutamate stimulation of the AMPA receptors, considerable attention has focused on the possible pharmacotherapeutic uses for these compounds. The term ampakine was coined by RespireRx scientists to describe any drug that enhanced the actions of glutamate at its AMPA receptor by positive allosteric modulation. The first ampakine to be discovered was aniracetam, followed by the benzothiazides, diazoxides and cyclothiazides. These early efforts led to directed chemical synthetic efforts by a number of groups, but primarily RespireRx (then called Cortex Pharmaceuticals) and Lilly Research Labs. Lilly scientists developed a novel series of highly active biarylpropylsulfonamides, based on their ability to act at the cyclothiazide binding site. RespireRx scientists developed several novel families of compounds, initially using aniracetam as a starting point (see Figure 2). These early ampakines were active in a variety of animal models that had been developed to predict pharmacotherapeutic benefits. Unfortunately, because these early ampakines were not designed for their actions as ampakines, they suffered from various problems that limited their use as drugs. While the thiazides were very potent and efficacious, their therapeutic ratio was limited by the production of undesirable side effects, such as convulsions, a problem also faced by their descendant compounds. On the other hand, aniracetam was limited in its therapeutic development because of its low potency and rapid metabolism, a problem also displayed in its early descendant compounds. It should be emphasized, however, that neither aniracetam nor the thiadiazides had specifically been developed for AMPA receptors but, despite their limited therapeutic use, these early ampakines became important tools for exploring molecular mechanisms of action. Early in the development of ampakines, RespireRx chemists synthesized two novel benzoylpiperidine ampakines (CX516 and CX546) that, despite their structural similarities, appeared to have significantly different pharmacological properties (see Figure 2). This discovery led to the identification of two classes of ampakines with markedly different pharmacological profiles. Like benzothiazides and biarylpropylsulfonamides, CX546 (termed a high impact compound) bound to the cyclothiazide binding site of the AMPA receptor, prolonged time to deactivation, inhibited desensitization in excised hippocampal patches, and prolonged synaptically evoked response duration using whole-cell recordings from CA1 pyramidal neurons of hippocampal slices. In contrast, CX516 (termed a low impact compound) did not bind to the cyclothiazide binding site, primarily increased amplitude much more than it prolonged deactivation, inhibited desensitization in excised hippocampal patches, and increased rather than prolonged synaptically evoked responses. Based on these findings, RespireRx developed a kinetic receptor model in which CX546 (high impact) mainly slows channel closing, while CX516 (low impact) preferentially accelerates channel opening. Highlighting the differences between these two compounds are the observations that CX546 produced epileptiform-like discharges in hippocampal slices, while CX516 did not, thereby differentiating the high impact versus low impact ampakines by their propensity to produce convulsions, or seizure potential. Subsequent studies demonstrated that, despite differences in their molecular mechanisms of action, these two compounds displayed very similar behavioral effects in certain animal models of cognition, depression, ADHD and other central nervous system disorders. The positive behavioral effects of CX516, in the absence of the convulsant effects produced by CX546, raised the possibility that it might be possible to differentiate the therapeutic effects of the ampakines from their undesirable seizure potential. For this reason, and despite its relatively short half-life, CX516 was employed in a few clinical trials to evaluate the compound’s memory enhancing potential. When administered to healthy young male volunteers, a relatively low dose of CX516 significantly improved delayed retention of visual material, ability to identify difficult odors and learning of a visuospatial maze. While results from later studies were equivocal, some of these differences were believed to be due to the low potency of CX516 as well as the drug’s short half-life. While additional high impact ampakines such as CX614 (see Figure 2) were synthesized, the poor side effect profiles of high impact ampakines led to the termination of their research programs at both RespireRx and Lilly. The continuation of the low impact ampakine program at RespireRx subsequently led to the discovery and patenting of several new classes of chemical structures, exemplified by CX717 and CX1739 (see Figure 2). These compounds retained the beneficial properties of the early low impact ampakines, while proving to be more potent with considerably better pharmacokinetic profiles. The differences between the high and low impact ampakines can best be appreciated in the next series of figures. In Figure 3A, brief application of AMPA to an individual neuron produces a fast current that is rapidly deactivated. 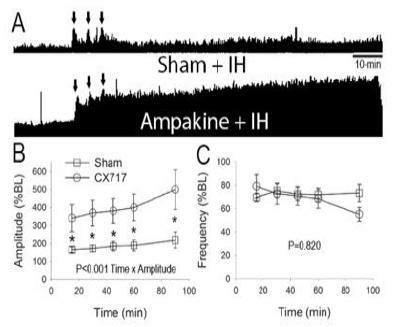 The co-application of CX717, a low impact ampakine, enhances the amplitude of the AMPA mediated current, but does not affect the deactivation. In Figure 3B, the co-application of CX614, a high impact ampakine, enhances the amplitude of the AMPA mediated current, but also prolongs the current by slowing the deactivation. This distinction between low and high impact ampakines is also seen after prolonged application of AMPA. As shown in Figure 4A and B, the initial depolarization produced by AMPA undergoes rapid and almost complete desensitization, despite the continued application of AMPA. We believe that this desensitization process is an adaptive, regulatory mechanism to prevent over-stimulation of the neurons. CX614 produces a dose-related, complete inhibition of desensitization, while CX717 produces only minimal effects. We believe that interference with basic, adaptive, regulatory mechanisms that neurons use to prevent hyper-excitability is responsible for the convulsive properties of the high impact ampakines. In order to test this hypothesis, extracellular field potentials from CA1 pyramidal cells were recorded as population spikes with glass micropipettes after single pulse electrical stimulation of the Schaffer-commissural fiber afferents. As can be seen in Figure 5, under control conditions, single pulses produced single population spikes. In the presence of CX614, multiple spikes were recorded, reminiscent of epileptiform-like activity. These effects were not produced by CX717 or any other low impact compounds that have been tested in this procedure. Additionally, unlike high impact ampakines and even after administration of high doses, no low impact ampakines have been observed to produce in animals either overt convulsions or increased sensitivity to known convulsant agents. Likewise, low impact ampakines are safe and well tolerated in humans. In addition to these translational studies, CX717 and CX1739, our lead clinical compounds, were tested and shown to be active in a variety of animal models designed to predict pharmacotherapeutic activity and have undergone animal toxicological testing sufficient to support 180 and 28 days of clinical administration, respectively. To date, two hundred and eighty-one (281) human subjects have been administered CX717 in 7 Phase 1 and 2 clinical trials, with no deaths, serious adverse events, or dose-limiting adverse events encountered. In two Phase 2A studies, single dose administration of CX717 antagonized the respiratory depressant effects of alfentanil, a potent opioid, without altering its analgesic effects (see below). It also demonstrated positive effects in a 3-week Phase 2 study in patients with adult ADHD (see below). Likewise, to date, 127 human subjects have received at least one dose of CX1739, including single doses up to 1200 mg and multiple daily doses of up to 1200 mg/day for 7 days for the assessment of safety, tolerability, and pharmacokinetic and pharmacodynamic parameters. No deaths, serious adverse events, or dose-limiting adverse events have been associated with the administration of CX1739. In a recently completed Phase 2A clinical trial, CX1739 antagonized the respiratory depressant effects of remifentanil in a model of chronic opioid consumption, without altering its analgesic properties (see below). In addition, RespireRx is developing CX1942, a soluble pro-drug, as a low impact ampakine. CX1942 is in the preclinical research stage, where it has demonstrated the ability to selectively antagonize opioid induced respiratory depression (OIRD), as well as positive results in certain animal models predictive of other pharmacotherapeutic effects. Across the United States people are suffering from what has been called “The Opioid Epidemic”, with tens of thousands of people dying every year from overdose. This epidemic is not restricted to people consuming illegal street drugs. In fact, more than half of the deaths result from the legal, prescription use of opioids, and 80% of heroin users report that they used prescription drugs prior to heroin. The cause of these fatalities is the respiratory depressant effects of the opioids, or opioid induced apnea. Opioid analgesics are now the most commonly prescribed class of medications in the United States, where chronic pain is estimated to affect around 68 million people each year. In 2014 alone, U.S. retail pharmacies dispensed 245 million prescriptions for opioid pain relievers. While the opiate epidemic has been widely highlighted in the medical and popular press, the extent of the crisis is still underappreciated. To put the problem in perspective, one-third of all adults, and nearly 40% of older Americans experience chronic pain, with an estimated 10 to 11 million people in the U.S. being prescribed chronic opioid analgesics for non-cancer pain. Trends in opioid prescribing, which have seen a four-fold increase in the last decade, have serious consequences to the health of the nation. A potentially life-threatening side effect of opioid therapy is apnea, the primary cause of death in opioid overdose. In 2016, more persons died from drug overdoses in the United States than during any previous year on record, culminating with an estimated 70,000 deaths with 61% of drug overdose deaths attributable to prescription opioids. The rate of emergency department visits for opioid overdose quadrupled from 1993 to 2010 and now, every day, over 1,000 people are treated in emergency departments for adverse effects of prescription opioids. Increased risk of overdose was observed among patients receiving medically prescribed opioids at higher dosage levels; most opioid overdoses were medically serious, and 12% were fatal. The Department of Health and Human Services (HHS) has deemed prescription-opioid overdose deaths an epidemic and prompted multiple federal, state, and local actions. Among patients on chronic opioid therapy for at least 6 months, the prevalence of apnea and hypopnea has been diagnosed in 50% - 75% of patients screened. Initially, these symptoms usually appear during sleep. The National Institutes of Health (NIH) and the National Institute of Drug Addiction (NIDA) have listed apnea and hypopnea, including central sleep apnea, as a significant risk factor for opioid addiction and overdose. Unfortunately, the vast majority of chronic opioid users are never screened for apnea, so the risk, therefore, may be underestimated. Opioid induced apnea can cause significant declines in health-related quality of life and increased health care costs. Undiagnosed apnea leads to increased risk of health complications, work-place errors and traffic accidents, leading to significant economic costs estimated to be between $1,950 and $3,899, per patient, per year. Based on the epidemiology of CSA and opioid prescribing trends, however, there are at least 3 million, and perhaps as many as 6 million people on chronic opioid therapy who are at increased risk of opioid induced apnea and overdose. While naloxone, in its various forms, has proven to be of immense value in the acute, emergency setting to rescue people from opioid overdose, it cannot be used chronically as a prophylactic because naloxone negates the desired pain-relieving effects at the same time that it antagonizes the respiratory depressant effects of opioids. Various groups are attempting to develop novel analgesics that are devoid of the respiratory depressant effects of the opioids, but ultimate success is uncertain. Attempts to interfere with the addictive properties of the opioids so as to minimize their illegal use are equally uncertain and ignore the fact that the majority of deaths occur among patients who are taking legal prescription opioids for chronic pain. Until these alternative approaches meet with success, there exists an enormous unmet need to save lives now by providing some sort of prophylactic agent that will reduce the lethality without diminishing the therapeutic actions of the opioids. RespireRx has focused its translational research program to develop treatments for the prevention of opioid overdose. In collaboration with Dr. John Greer from the University of Alberta, who conducted the initial groundbreaking work, RespireRx has conducted an elegant series of translational research experiments ranging from single cell electrophysiological recordings, to in vitro brain-slice methodology, through animal models of behavior and physiology, and ultimately leading to Phase 2 human clinical trials. Pre-clinical experiments in animal models of respiration have demonstrated that activation of opioid receptors decreases the activity of pre-BötC neurons, leading to hypopnea (a slowing of breathing), apnea (a cessation of breathing) and, at high opioid doses, death. In animals treated with ampakines, however, activation of the AMPA glutamate receptors on the pre-BötC cells selectively counteracts the respiratory depressant effects of the opioids and protects from lethality without altering the analgesic properties of the opioids. Using plethysmographic recordings from rats, administration of fentanyl produces a rapid cessation of breathing, followed by lethality (see Figure 6A). 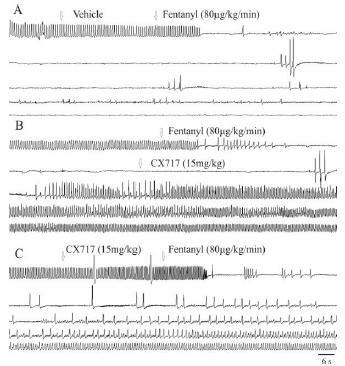 CX717, administered either after (Figure 6B) or before (Figure 6C) fentanyl, dramatically reduced the respiratory depression and lethality. Dose dependent antagonism of opioid induced respiratory depression was obtained from all three low impact ampakines being developed - CX717, CX1739 and CX1942 (see Figure 7). *Tracings taken from plethysmographic recordings of rats. Each deflection reflects a breath. In addition, opioid induced analgesia was measured in a rat hot plate procedure in which latency to remove paws from the painful thermal stimulus was determined. If no response was made by 20 seconds, the trial was terminated and latency was recorded as >20 sec. 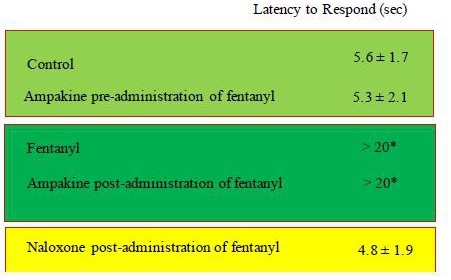 As can be seen in Table 1, fentanyl dramatically increased latency times, an effect that was not altered by administration of an ampakine at a dose that completely antagonized the respiratory depression. As an active control, naloxone produced its well known antagonism of the opioid induced analgesia. The results of our preclinical research studies have been replicated in three separate Phase 2A human clinical trials with two ampakines, CX717 and CX1739, confirming the translational mechanism and target site engagement and demonstrating proof of principle that ampakines can be used in humans for the prevention of opioid induced apnea. For example, in a previously reported study, oral administration of CX717 prior to intravenous infusion of alfentanil produced no effect on basal respiration, but completely antagonized the respiratory depression produced by alfentanil. This antagonism was comparable to that produced by naloxone, an opioid receptor antagonist (see Figure 8A). Alfentanil reduced the perceived pain produced by electrical stimulation to the finger, an effect which was antagonized by naloxone, but not by CX717 (Figure 8B). RespireRx recently completed a Phase 2A clinical trial that evaluated the ability of CX1739 to overcome the respiratory depression induced by the powerful, yet short-acting opioid, remifentanil in two models of opioid use: 1.) REMI-Bolus evaluated respiratory parameters in an opioid overdose model, using a bolus of remifentanil (1 mcg/kg) to achieve significant respiratory depression; 2.) REMI-Infusion evaluated respiratory, pain, and pupilometry parameters using an infusion of remifentanil at a steady state blood concentration of 2 ng/ml to achieve approximately 40 - 50% respiratory depression as a model of sub-acute, post-surgical intravenous opioid treatment as well as chronic oral opioid treatment for chronic pain. The results of the REMI-Infusion analysis demonstrated that, compared to placebo, an acute dose of CX1739 (300 mg or 900 mg) significantly reduced OIRD under steady-state opioid concentrations (see Figure 9). The results of the REMI-Bolus analysis demonstrated that CX1739 was unable to prevent the rapid respiratory depression that occurs after intravenous, bolus injection of remifentanil. The remifentanil effects on analgesia, pupilometry and bispectral index were not altered by CX1739. 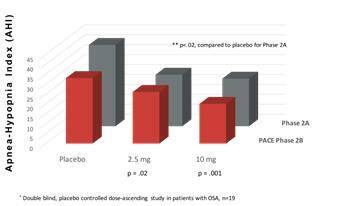 Administration of CX1739 at an acute dose up to 900 mg was safe and comparable to placebo. In conjunction with NIDA, we are planning a clinical strategy to develop ampakines as a prophylactic treatment to prevent opioid overdose and a formulation strategy to develop combination therapies with ampakines and naloxone that offer enhanced respiratory safety advantages as a long-term rescue medication with extended duration of action. An estimated 17,000 new cases of spinal cord injury occur each year in the United States, most a result of automobile accidents. Currently, there are roughly 282,000 people living with spinal cord injuries, and many of these patients have impaired respiratory motor function, a major cause of morbidity and mortality following spinal cord injury. In fact, diseases of the respiratory system (particularly pneumonia) are the leading cause of death in people with SCI. Ampakines have potential utility in the treatment and management of SCI to enhance respiration and other motors functions, and improve the quality of life for SCI patients. Spinal cord injury can profoundly impair respiratory motor function and neural plasticity leading to significant morbidity and mortality in human accident victims. Plasticity is a fundamental property of the nervous system that enables continuous alteration of neural pathways and synapses in response to experience or injury. One frequently studied model of respiratory plasticity is long-term facilitation of phrenic motor output (pLTF). A large body of literature exists regarding the ability of ampakines to stimulate neural plasticity, possibly due to an enhanced synthesis and secretion of various growth factors. Recently, studies of acute intermittent hypoxia (AIH) in patients with spinal cord injury demonstrate that neural plasticity can be induced to restore respiratory function and reduce the need for mechanical ventilation. This approach, known as long-term facilitation (LTF), is based on physiological mechanisms associated with the ability of spinal circuitry to learn how previous repeated hypoxic bouts affect breathing by adjusting synaptic strength between respiratory neurons. Because AIH induces spinal plasticity, the potential exists to harness repetitive AIH as a means of inducing functional recovery in conditions causing respiratory insufficiency, such as cervical spinal injury. Because repetitive AIH induces phenotypic plasticity in respiratory motor neurons, it may restore respiratory motor function in patients with incomplete spinal injury. AIH has also been reported to improve other motor functions as well. RespireRx has been working with Dr. David Fuller, at the University of Florida, to evaluate the use of ampakines with and without AIH for the treatment of compromised motor function in SCI. 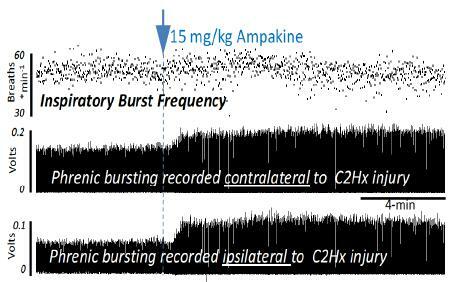 Eight weeks following C2 spinal hemisection in mice, intravenous injections of CX717 (15mg/kg) increases phrenic nerve amplitude bilaterally with no impact on burst frequency (see Figure 10). The effect on the hemisected side is greater than that measured on the intact side, with the recovery approximating that seen on the intact side prior to administration of ampakine. These animal models of respiration following spinal cord injury support proof of concept for a new treatment paradigm using ampakines in conjunction with AIH to promote respiratory and other motor functions in patients with SCI. RespireRx is continuing it collaborative preclinical research with Dr. Fuller while it is planning a clinical trial program focused on developing ampakines with and without AIH for the restoration of respiratory and other motor functions in patients with SCI. The company is working with our clinical advisory panel and with researchers at the University of Miami, the Miami Project and the Detroit VA to finalize a Phase II clinical trial protocol. ADHD is one of the most common neurobehavioral disorders, with 6.1% of all American children taking medication for treatment. ADHD is estimated to affect 7.8% of U.S. children aged 4 to 17, according to the U.S. Centers for Disease Control and Prevention or approximately 4.5 million children. The principal characteristics of ADHD are inattention, hyperactivity and impulsivity. In up to 65% of children affected by this disorder, symptoms will persist into adulthood, with estimates of approximately 9.9 million adults in the United States having ADHD. ADHD can negatively impair many aspects of daily life, including home, school, work and interpersonal relationships. Currently available treatments for ADHD include stimulant and non-stimulant agents targeting the monoaminergic receptor systems in the brain. However, these receptors are not restricted to the brain and are widely found throughout the body. Thus, while these agents can be effective in ameliorating ADHD symptoms, they also can produce adverse cardiovascular effects, such as increased heart rate and blood pressure. Existing treatments also affect eating habits and can reduce weight gain and growth in children, and have been associated with suicidal ideation in adolescents and adults. In addition, approved stimulant treatments, such as amphetamine, are DEA classified as controlled substances and present logistical issues for distribution and protection from diversion. Various investigators have generated data supporting the concept that alterations in AMPA receptor function might underly the production of some of the symptoms of ADHD. In rodent and primate models of cognition, ampakines have been demonstrated to reduce inattention and impulsivity, two of the cardinal symptoms of ADHD. Furthermore, ampakines do not stimulate spontaneous locomotor activity in either mice or rats, unlike the stimulants presently used for the treatment of ADHD, nor do they increase the stimulation produced by amphetamine or cocaine. These preclinical considerations prompted us to conduct, in adults with ADHD, a Phase 2, randomized, double-blind, two period crossover study comparing the efficacy and safety of two separate doses of CX717 (200 mg BID or 800 mg BID) with placebo. Subjects were orally administered either placebo, low dose (200 mg BID) or high dose (800 mg BID) for three weeks, followed by a two week washout and then an additional three weeks of dosing using a randomized crossover design. The primary outcome measure was the ADHD-RS total score, which evaluates the severity of ADHD symptoms, as well as the ADHD-RS hyperactivity and inattentiveness subscales, which were secondary efficacy variables. In a repeated measures analysis, a significant treatment effect on ADHD-RS was observed with high dose CX717 compared to placebo (p< 0.003). The differences between high dose CX717 and placebo were seen as early as Week 1 of treatment and continued throughout the remainder of the study. No meaningful differences in the ADHD RS total scores were observed between low dose CX717 and placebo. In general, results for both the ADHD-RS hyperactivity and inattentiveness subscales paralleled the results of the total score. Using a repeated measures analysis, both hyperactivity (p<0.02) and inattentiveness (p<0.03) symptoms improved significantly with the high dose compared to placebo. Based on these clinical results, we believe that CX717 might represent a breakthrough opportunity to develop a non-stimulating therapeutic for ADHD. We are planning to continue this program with a Phase 2B clinical trial in patients with adult ADHD. More than 3.5 million Americans live with an Autism Spectrum Disorder (ASD), a complex neurodevelopmental disorder with a rising global prevalence of over 1%. Fragile X Syndrome (FXS) is the most common identifiable single-gene cause of autism, responsible for approximately 5% of cases. Individuals with FXS and ASD exhibit a range of abnormal behaviors comprising hyperactivity and attention problems, executive function deficits, hyper-reactivity to stimuli, anxiety and mood instability. The prevalence rate of ASD has risen from 1 in 150 children in 2000 to 1 in 68 children in 2010, with current estimates indicating a significant rise in ASD diagnosis to over 2% or 1 in 45 children, placing a significant emotional and economic burden on families and educational systems. Since “autistic disturbances” were first identified in children in 1943, extensive research efforts have attempted to identify the genetic, molecular, environmental, and clinical causes of ASD, but until recently the underlying etiology of the disorder remained elusive. Today, there are no medications that can treat ASD or its core symptoms, and only two FDA approved anti-psychotic drugs, aripiprazole and risperidone, are approved for the treatment of irritability associated with ASD. Thanks to wide ranging translational research efforts, FXS and ASD are currently recognized as disorders of the synapse with alterations in different forms of synaptic communication and neuronal network connectivity. Focusing on the proteins and subunits of the AMPA receptor complex, autism researchers at the University of San Diego (UCSD) have proposed that AMPA receptor malfunction and disrupted glutamate signal transmission may play an etiologic role in the behavioral, emotional and neurocognitive phenotypes that remain the standard for ASD diagnosis. For example, Stargazin, also known as CACNG2 (Ca2+ channel g2 subunit) is one of four closely related proteins recently categorized as transmembrane AMPA receptor regulating proteins (TARPs). Researchers at the University of California San Diego (UCSD) have been studying genetic mutations in the AMPA receptor complex that lead to cognitive and functional deficiencies along the autism spectrum. They work with patients and their families to conduct detailed genetic analyses in order to better understand the underlying mechanisms of autism. In one case, they have been working with a teenage patient who has an autism diagnosis, with a phenotype that is characterized by subtle Tourette-like behaviors, extreme aggression, and verbal & physical outbursts with disordered thought. Despite the behaviors, his language is normal. Using next generation sequencing and genome editing technologies, the researchers identified a Stargazin mutation (deletion of exon 2 of CACNG2) and introduced the aberrant sequence into C57bL6 mice using CRISPR (Clustered Regulatory Interspaced Short Palindromic Repeats). The heterozygous allele has a dominant negative effect on the trafficking of post-synaptic AMPA receptors and produces behaviors that are consistent with a glutamatergic deficit, including reduced anxiety-like behavior, reduced grooming, and reduced pre-pulse inhibition, similar to what has been observed in the teenage patient. With funding from the National Institutes of Health, RespireRx is working with UCSD to explore the use of ampakines for the amelioration of the cognitive deficits associated with the AMPA receptor gene mutations. Preliminary results indicate that the ampakines might reduce inattention and impulsivity measured in rodent behavioral models and, depending on outside funding, we anticipate beginning a small clinical trial late this year. Orphan diseases represent significant market opportunities for ampakines. Orphan drugs provide market exclusivity of 7 Years in the US and 10 years in the EU. Further, the US offers reduced research and development costs with a 50% tax credit, and FDA user fees are waived for products with revenues less than $50 million. Preclinical research on ampakines has demonstrated that CX717 and CX1739 can improve respiratory function in animal models of certain orphan disorders, such as Pompé Disease and perinatal respiratory distress. The company is actively working with experts and noted centers of excellence for the treatment of these rare disorders to bring new therapies to the clinic. RespireRx is working with researchers at the University of Florida, who have demonstrated the ability of ampakines to treat respiratory insufficiency in a mouse model of Pompé Disease. Additionally, we have supported the research at the University of Alberta that demonstrated the potential for ampakines to treat apnea of prematurity. Lastly, RespireRx has teamed with researchers at UCSD on a personalized, translational medicine project to facilitate a treatment for a boy with Fragile X Autism (see above). These research and development partnerships with key opinion leaders at leading academic institutions demonstrate the potential for developing the ampakines for the treatment of rare pediatric diseases. The U.S. FDA has established a priority review program to encourage treatments for rare pediatric diseases (RPDs). Pompé Disease, Apnea of Prematurity, and Fragile X Autism each meet the criteria for a rare pediatric disease. The priority review program confers regulatory review benefits on the developers of drugs for RPDs, but as importantly, the Agency provides an added incentive with a priority review voucher, to whit: The Secretary shall award a priority review voucher to the sponsor of a rare pediatric disease product application upon approval by the Secretary of such rare pediatric disease product application. The PRD Voucher, sometimes referred to as the “Golden Ticket” bestows accelerated regulatory review and approval times that can provide six months or more of market exclusivity and increased sales opportunities. The real beauty of the voucher is that it can be sold to an unrelated third party: The sponsor of a rare pediatric disease product application that receives a priority review voucher under this section may transfer (including by sale) the entitlement to such voucher. There is no limit on the number of times a priority review voucher may be transferred before such voucher is used. To date, six vouchers have been awarded and four have been sold, the latest to AbbVie for $350 Million. Pompé Disease results from a mutation in the acid alpha-glucosidase gene leading to lysosomal glycogen accumulation. Respiratory insufficiency is common and the current FDA-approved treatment, enzyme replacement, has limited effectiveness. Ampakines stimulate respiratory neuromotor output and ventilation in a mutant mouse model of Pompé and may have potential as an adjunctive therapy in Pompé disease. In this mutant mouse model, ampakines robustly increase phrenic and hypoglossal inspiratory bursting and reduced respiratory cycle variability in anesthetized mutant mice, and increased inspiratory tidal volume in unanesthetized mutant mice. Apnea of prematurity is defined as cessation of breathing by a premature infant that lasts for more than 15 seconds and is accompanied by low blood oxygen levels (hypoxemia) and lowered heart rate (bradycardia). Apnea of prematurity, which can be obstructive, central, and mixed, occurs to varying degrees in more than 85% of infants who are born at less than 34 weeks of gestation. Ampakines have been shown to enhance weak endogenous respiratory drive and reduce the incidence of apneas in perinatal rats. This includes alleviation of respiratory depression and apneas induced by hypoxia. Using in vitro brainstem–spinal cord preparations, the laboratory of Dr. John Greer at the University of Alberta has demonstrated that ampakines markedly increase respiratory drive and reduce the incidence of apnea using in vitro and in vivo perinatal rat models under normoxic and hypoxic conditions. Additionally, in vivo plethysmographic recordings from postnatal Day 0 rats demonstrated that ampakines increase the frequency and regularity of ventilation, reduce apneas and protect against hypoxia-induced respiratory depression. These data indicate a potential supplementary pharmacological therapy to methylxanthenes for countering apnea of prematurity in the clinic. To augment the executive team, RespireRx has assembled a world-renowned group of experts in the fields of sleep medicine, anesthesia, pain management, neurology, and psychiatry to act as a clinical advisory panel in helping guide our strategic clinical development effort. RespireRx owns patents claiming the composition of matter for various ampakines, including CX1739, CX1942 and related compounds, and owns and has licensed exclusive rights to patents and patent applications claiming the use of ampakines, including CX717, CX1739 and CX1942, for the treatment of certain breathing disorders and neuropsychiatric disorders, including ADHD, impaired cognition and depression. Certain statements included or incorporated by reference in this Executive Summary, including information as to the future financial or operating performance of the Company and its drug development programs, constitute forward-looking statements. The words “believe,” “expect,” “anticipate,” “contemplate,” “target,” “plan,” “intend,” “continue,” “budget,” “estimate,” “may,” “schedule” and similar expressions identify forward-looking statements. Forward-looking statements include, among other things, statements regarding future plans, targets, estimates and assumptions. Forward-looking statements are necessarily based upon a number of estimates and assumptions that, while considered reasonable by the Company, are inherently subject to significant business, economic and competitive uncertainties and contingencies. Many factors could cause the Company’s actual results to differ materially from those expressed or implied in any forward-looking statements made by, or on behalf of, the Company. Due to these various risks and uncertainties, actual events may differ materially from current expectations. Investors are cautioned that forward-looking statements are not guarantees of future performance and, accordingly, investors are cautioned not to put undue reliance on forward-looking statements due to the inherent uncertainty therein. Forward-looking statements are made as of the date of this news release and the Company disclaims any intent or obligation to update publicly such forward-looking statements, whether as a result of new information, future events or results or otherwise. The mission of RespireRx Pharmaceuticals is to develop innovative and revolutionary treatments to combat respiratory diseases caused by disruption of neuronal signaling. We are addressing respiratory conditions that affect millions of people, but for which there are few treatment options and no drug therapies, including obstructive sleep apnea (OSA), central sleep apnea (CSA), and disordered breathing from spinal cord injury (SCI) and neural dysfunction. Additionally, we are developing new drugs and formulations that address the widespread problem of opioid overdose, which results from opioid-induced respiratory depression (OIRD), both in patients who are on chronic opioid therapy for pain management and in the post-surgical setting. This executive summary provides an overview of the dronabinol platform for the treatment of OSA, including market opportunity, regulatory path, and financial projections. RespireRx holds the exclusive world-wide license to a broad family of patents for the use of cannabinoids in the treatment of sleep related breathing disorders from the University of Illinois at Chicago (UIC). There are six issued patents, and we have several extensions and pending applications that will extend patent protection for over a decade. The inventor, Dr. David Carley at UIC, recently completed a Phase 2B multi-center, double-blind, placebo-controlled clinical trial of dronabinol in patients with OSA replicating the earlier Phase 2A clinical trial results, that demonstrated statistically significant improvements in respiration, daytime sleepiness, and patient satisfaction with therapy. This clinical trial was fully funded by a ~$5 million grant from the National Heart, Lung and Blood Institute of the National Institutes of Health, and the results were presented at the annual meeting of the 31st Annual Meeting of the Associated Sleep Professional Societies LLC in June 2017, and described below. Under the terms of the license agreement, RespireRx now holds the exclusive rights to develop and commercialize dronabinol for sleep related breathing disorders. The use of dronabinol for the treatment of OSA is a new indication for an already approved drug, thereby allowing RespireRx or a development partner to submit a 505(b)2 application to FDA for approval of a new dronabinol label. This regulatory path may offer market protections under Hatch-Waxman provisions for market exclusivity at FDA. Other regulatory routes are available to pursue proprietary formulations of dronabinol that will provide further market protections. Obstructive sleep apnea syndrome (OSA) is a sleep-related breathing disorder that afflicts an estimated 29 million people in the United States and over 100 million people worldwide. 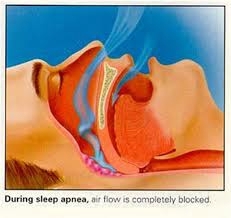 OSA involves a decrease or complete halt in airflow despite an ongoing effort to breathe during sleep. When the muscles relax during sleep, soft tissue in the back of the throat collapses and obstructs the upper airway. OSA remains significantly under-recognized, as only 21% in the U.S. and 20% globally have been properly diagnosed. About 24 percent of adult men and nine percent of adult women have the breathing symptoms of OSA with or without daytime sleepiness. OSA significantly impacts the lives of sufferers who do not get enough sleep; their quality of sleep is deteriorated such that daily function is compromised and limited. OSA is associated with decreased quality of life (QOL), significant functional impairment, and increased risk of road traffic accidents, especially in professions like transportation and shipping. as the strongest risk factor for obstructive sleep apnea, and the Wisconsin Sleep Cohort study showed that a one standard deviation difference in body mass index (BMI) was associated with a 4-fold increase in disease prevalence. Excess body weight is a common clinical finding and is present in more than 60% of the patients referred for a diagnostic sleep evaluation. Over the last 10 to 15 years, there have been dramatic increases in the number of overweight and obese adults in the United States and this obesity epidemic is believed to have contributed to an explosive growth of OSA and other sleep related disorders. Furthermore, the consequences of undiagnosed and untreated OSA are medically serious and economically costly. 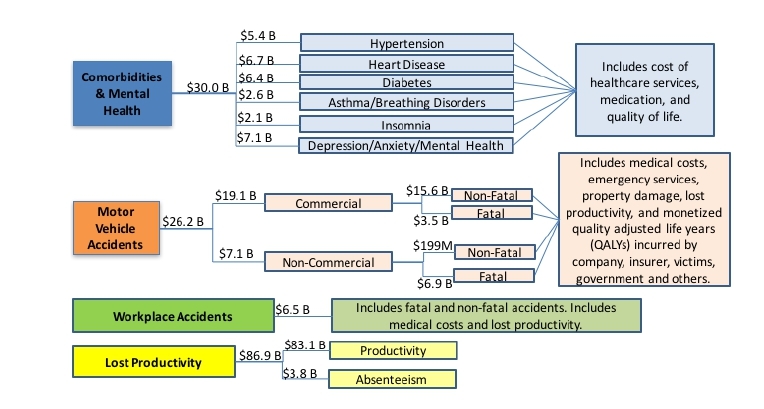 As illustrated in Figure 1, the economic burden of OSA in the U.S. is staggering, with cost estimates ranging to $162 Billion annually. Interestingly, the costs of undiagnosed OSA far exceed the costs of diagnosis and treatment, as illustrated in Table 1, which shows that the average cost to treat a patient with OSA is approximately $2,100 per year, but untreated OSA costs three times as much at $6,300 per patient. Clearly, a new drug therapy that is effective in reducing the medical and economic burden of OSA will have significant advantages for optimal pricing in this costly disease indication. Pharmacologic treatment for OSA is essentially non-existent due to the complexity of the neurochemical control and neuromodulation of central respiratory drive and the upper airway motor output. Nevertheless, the poor tolerance and long-term adherence to Continuous Positive Airway Pressure (CPAP) treatment in OSA, make discovery of such therapeutic alternatives clinically relevant and important. RespireRx’ translational research results demonstrate that dronabinol has the potential to become the first drug treatment for this large and underserved market. Dronabinol is a Schedule III, controlled generic drug that has been approved by the U.S. FDA for the treatment of AIDS-related anorexia and chemotherapy-induced emesis. Dronabinol is available in the United States as the branded prescription drug product Marinol® capsules. Marinol®, together with numerous generic formulations, is available in 2.5, 5, and 10 mg capsules, with a maximum labelled dosage of 20 mg/day for the AIDS indication, or 15 mg/m2 per dose for chemotherapy-induced emesis. Continuous Positive Airway Pressure (CPAP) is the most common treatment for OSA. CPAP devices work by blowing pressurized air into the nose, which keeps the pharyngeal airway open. CPAP is not curative, and patients must use the mask whenever they sleep. Reduction of the apnea/hypopnea index (AHI) is the standard objective measure of therapeutic response in OSA. In the sleep laboratory, CPAP is highly effective at reducing the AHI. However, the device is cumbersome and difficult for many patients to tolerate. Most studies describe that 25-50% of patients refuse to initiate or completely discontinue CPAP use within the first several months and that most patients who continue use the device only intermittently. Oral devices may be an option for patients who cannot tolerate CPAP. Several dental devices are available including the Mandibular Advancement Device (MAD) and the Tongue Retaining Device (TRD). The former is the most widely used dental device for sleep apnea and is similar in appearance to a sports mouth guard. It forces the lower jaw forward and down slightly which keeps the airway more open. The TRD is a splint that holds the tongue in place to keep the airway as open as possible. Like CPAP, oral devices are not curative for patients with OSA. The cost of these devices tends to be high and side effects associated with them include night time pain, dry lips, tooth discomfort, and excessive salivation. Patients with clinically significant OSA who cannot be adequately treated with CPAP or oral devices can elect to undergo surgery. The most common surgery is uvulopalatopharyngoplasty (UPPP), which involves the removal of excess tissue in the throat to make the airway wider. Other possible surgeries include tracheostomies, rebuilding of the lower jaw, and nose surgery. Patients who undergo surgery for the treatment of OSA risk complications, including infection, changes in voice frequency, and impaired sense of smell. Surgery is often unsuccessful and, at present, no method exists to reliably predict therapeutic outcome from any form of OSA surgery. Recently, another surgical option has become available based on upper airway stimulation. It is a combination of an implantable nerve stimulator and an external remote controlled by the patient. The hypoglossal nerve is a motor nerve that controls the tongue. The implanted device stimulates the nerve with every attempted breath, regardless of whether such stimulation is needed for that breath, to increase muscle tone to prevent the tongue and other soft tissues from collapsing. The surgically implanted device is turned on at night and off in the morning by the patient with the remote. Given the limited efficacy of most of the surgical options and the associated risks and the poor long-term compliance for mechanical devices, there exists a significant unmet medical need for a safe and effective treatment for OSA. A drug for the treatment for OSA has been sought for many years, but effective agents remain to be identified. Discovery efforts have been hampered by an incomplete understanding of the basic pathological mechanisms leading to apnea, lack of appropriate animal models to develop and test treatment strategies, and the multi-factorial nature of OSA. Through an extensive series of translational research projects from the cellular level through proof-of-concept clinical trials, research has demonstrated that dronabinol is an effective drug therapy for OSA. The pathogenic mechanisms leading to OSA have not been fully defined despite several decades of intensive investigation. Four factors affecting upper airway patency have been identified: 1) redundant oro- and hypo-pharyngeal tissue, 2) edema within these same tissues, 3) narrow airway caliber, and 4) increased airway collapsibility. During wakefulness, these stressors are successfully counterbalanced by activation of intrinsic dilating muscles within upper airway structures. With sleep onset, the relevant neuromuscular compensatory reflexes become at least intermittently inadequate, leading to upper airway obstruction in the form of apnea (transient cessation of airflow) or hypopnea (transient reduction in airflow). Apneas and hypopneas, in turn, produce hypoventilation with hypoxia and hypercapnia as well as concomitant increases of inspiratory effort, culminating in arousal from sleep and restoration of airflow. This cycle can repeat hundreds of times in a single night of sleep. While no true standard exists, it is generally accepted that AHI ranges of 5-15, 15-30, and >30 reflect mild, moderate, and severe OSA, respectively. The American Academy of Sleep Medicine (AASM) recognizes that sleep related breathing disorders arise from a combination of neural dysregulation and an inadequately defended upper airway system. Fenik et al. (2001) showed that pharmacologic modulation of sensory neurons located in the nodose ganglia and innervating the airways may play an important role in regulating both inspiratory effort and in setting the level of activity in the upper airway dilator muscles. On this basis, Dr. David Carley, the inventor of our licensed patents from the University of Illinois-Chicago, hypothesized that vagus afferent neurons based in the nodose ganglia may exert an important influence on the compensatory abilities of a compromised upper airway, and thus on the predisposition of an individual to experience sleep- related apneas and hypopneas. This possibility has therapeutic implications for sleep related breathing disorders, as the excitability of nodose ganglion neurons is regulated by a number of endogenous neurotransmitter systems, including endocannabinoids, serotonin (5HT), GABA, dopamine and opioids. The pharmacologic rationale for developing dronabinol for the treatment of OSA is based on the role of vagal imbalance in OSA. Dr. Carley and his colleagues created rat models of OSA by measuring spontaneously occurring sleep apneas as well as apneas produced by injections of 5HT, which altered vagal tone through its actions on 5HT receptors in the nodose ganglia. Recognizing that the excitability of nodose ganglion neurons can be regulated by cannabinoids, Dr. Carley and his colleagues conducted a series of translational research experiments to ascertain the ability of cannabinoids to reduce OSA and determine their mechanism and site of action. As illustrated in Figure 2, these studies demonstrated that dronabinol, acting at CB1 & CB2 receptors in the nodose ganglion, was able to attenuate 5HT-induced reflex apneas in the rat model of OSA. In a rat model of sleep related breathing disorders, dronabinol injections produced dose-dependent reductions in sleep apneas either spontaneously occurring or induced by 5HT injections, during both NREM and REM sleep (Carley et al. SLEEP, Vol. 25, No. 4, 2002). Acute injections of dronabinol also improved sleep consolidation and deep sleep, and this represents an important potential secondary benefit, as repetitive arousals from sleep are thought to contribute importantly to daytime sleepiness, one of the primary symptoms of OSA. Based on Dr. Carley’s preclinical results, the Company conducted a 21 day, randomized, double-blind, placebo-controlled, dose escalation Phase 2 clinical study in 22 patients with OSA, in which dronabinol produced statistically significant reductions in the Apnea-Hypopnea Index (AHI), the primary therapeutic end-point, and was observed to be safe and well tolerated (Prasad et al, Frontiers in Psychiatry, 2013). Compared to baseline, dronabinol treatment produced a statistically significant improvement in AHI, with an overall reduction of 32%. Both the 2.5 mg and 10 mg doses of dronabinol significantly reduced AHI (events/hr) from baseline (LS (least squares) mean change -10.43 and -13.27; p-values = 0.007 and 0.036, respectively). The AHI reduction produced by the 5 mg dose (LS mean change -5.78), however, did not reach statistical significance (p-value = 0.166). 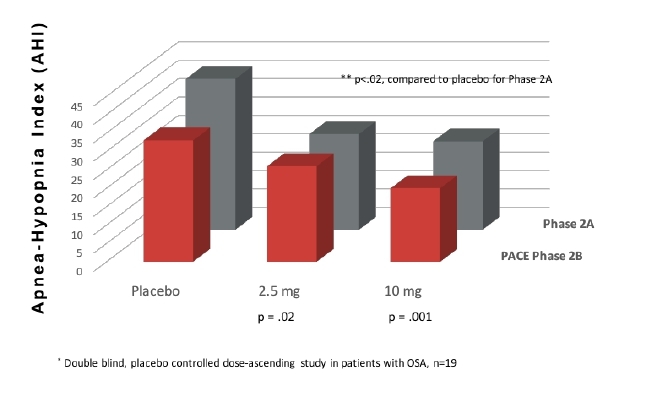 The placebo group, on the other hand, showed an increase of 6.37 events/hr, which was significantly different from the 2.5 mg and 10 mg doses (p = 0.011 and 0.018, respectively) but not significantly different from the intermediate 5 mg dose (p = 0.067), as shown in Table 2. 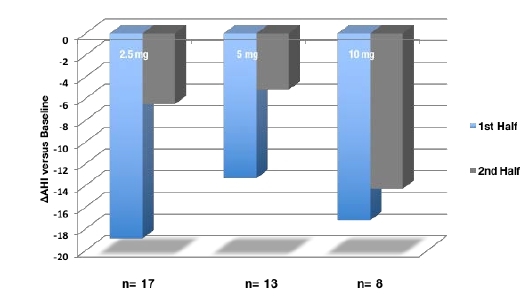 As illustrated in Figure 3, during the first half of the night , the 2.5 mg and 5.0 mg doses of dronabinol were equally effective as the 10 mg dose in reducing AHI. In the second half of the night, however, only the 10 mg dose maintained the effect. Since the blood half-life of dronabinol is ~4 hours, the effectiveness of the lower doses appears to dissipate once drug levels fall below a minimal therapeutic level. Low-dose dronabinol, which is covered by a pending patent, may be therapeutically effective with a controlled release, proprietary formulation. Quantitative EEG measures of the sleep process in these patients demonstrated that increasing doses of dronabinol were associated with a shift in EEG power toward delta and theta frequencies and a strengthening of ultradian rhythms in the sleep EEG (Carley et al, J. Clinical Sleep Medicine, 2014). These results suggest that oral dronabinol may improve restorative aspects of the sleep process, contributing to the observed decrease in daytime sleepiness, despite the absence of changes in overall sleep stage percentages or sleep efficiency. 1 The number of patients receiving the specified dose at the time of the measurement. Patients could receive any dose level for more than one treatment period; therefore, the number of observations may be greater than the number of patients. Computations include all observations at a particular dose. 2 LS mean of difference from baseline. 3 P-value for the null hypothesis that mean treatment effect (LS Mean) is equal to zero. 4 LS mean difference of dronabinol treatment from placebo. 5 P-value for the comparison of dronabinol versus placebo at each dose level. Figure 3. Seventeen adults with OSA were administered dronabinol after baseline polysomnogram (PSG), starting at 2.5mg once daily. 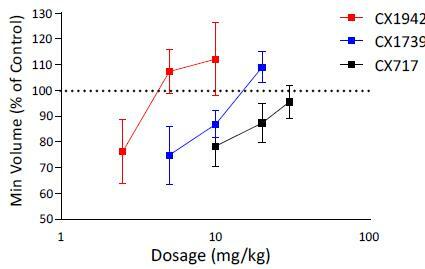 The dose was increased weekly, as tolerated, to 5mg and finally to 10mg once daily. Repeat PSG assessments were performed on nights 7, 14, and 21 of dronabinol treatment. Change in AHI (DAHI, mean ± SD) was significant from baseline to night 21 for the entire night (14.117.5; p = 0.007) at the 10 mg dose. The change in AHI at the 2.5 mg and 5.0 mg doses was statistically significant only for the first half of the night. The efficacy results clearly showed that all three dronabinol doses resulted in a significant improvement (decrease) in AHI scores compared to a worsening of scores in the placebo group. Further, in the supine position, all dronabinol treatments had further improvements in AHI scores compared to placebo. There was no apparent dose dependence to the dronabinol improvements as the 2.5 mg and 10 mg doses had similar decreases relative to placebo overall as well as in the supine position, however, the 5 mg dose improvements were less than the other dronabinol doses. Similar significant improvements were observed with the dronabinol treatments during non-REM sleep; however, the greatest improvements (more than 3 times) were seen in the first half compared to the second half of sleep time. Compared to placebo, the dronabinol doses had no significant improvement on Sleep Efficiency and Arousal Index scores. Duration of arterial oxygen saturation <90% and absolute minimum oxygen saturation were not significantly affected by dronabinol. However, the overall mean values for the minimum oxygen saturation were improved >2% in the 2.5 and 10 mg dronabinol doses, consistent with the greatest improvement in AHI scores observed with these doses. There were no Serious Adverse Events (SAEs) reported during the study. A total of 7 patients reported 8 non-Treatment Emergent Adverse Events (TEAEs) in the study. The incidences of TEAEs are summarized in Table 11 by preferred term (PT) for two or more patients who reported the specific event. For patients with multiples of the same PT, the patient was only counted once. The placebo group reported the greatest overall incidence of any TEAE, while the 5 mg dronabinol treatment had the lowest. Consistent with the Marinol® prescribing information, the most frequent TEAEs occurred as nervous system disorders (sedation, somnolence, dizziness and headache); the 2.5 mg dronabinol treatment reporting the highest incidences. Although fewer patients were treated with the 5 and 10 mg dronabinol doses, the incidences decreased considerably in these treatment periods. Most of the TEAE incidences were considered drug-related (possibly, probably or definitely) including those in the placebo group. All TEAEs were either mild or moderate except for one placebo-treated subject who reported a severe headache. There were no reports of adverse changes in physical examination or vital signs. These results support the safety and tolerability of repeated doses of dronabinol. 1 Counts and percentages are based on the number of patients receiving the specified dose for the given period. Patients with multiple AEs within a particular SOC are only counted, and patients with multiples of the same PT are only counted once. Analysis of the efficacy results by time of night has provided potential guidance on development of new, proprietary formulations of dronabinol. Low dosages of dronabinol, which are covered by a pending patent, may be therapeutically effective with a controlled release, proprietary formulation. Numerous opportunities exist for reformulation of dronabinol to produce a proprietary, branded product for the treatment of sleep disordered breathing. The pharmacokinetic profile of dronabinol is well-known, allowing for reformulations that are within the safety parameters established by commercially available dosage forms. A Phase I study conducted with Marinol outlines the pharmacokinetic measures for daily dronabinol usage (see Table 3). The recently completed PACE (Pharmacotherapy of Apnea by Cannabimimetic Enhancement) trial was a fully-blinded, two-center, Phase II, randomized placebo-controlled trial of dronabinol in 56 adult patients with moderate to severe OSA. By random assignment, 56 adult subjects with BMI<45, Epworth Sleepiness Scale (ESS)>7 and PSG-documented AHI between 15 and 50 received either placebo (N=17), 2.5mg (N=19) or 10.0mg (N=20) of dronabinol daily, one hour before bedtime for 6 weeks. Repeat in- laboratory PSG followed by maintenance of wakefulness (MWT) testing was completed every 2-weeks during the treatment period. At each visit, the ESS and Treatment Satisfaction Questionnaire for Medications also were completed. Overall, baseline AHI was 26.0±11.6 (SD) and this was equivalent among all treatment groups. In comparison to placebo, statistically significant end of treatment declines in AHI were observed for both the 2.5 and 10 mg doses (-9.7±4.1, p=0.02 and -13.2±4.0, p=0.001, respectively). Statistically significant declines in ESS were observed for subjects receiving 10 mg dronabinol (-4.0±0.8 units, p=0.001) but not those receiving 2.5 mg or placebo. Subjects receiving 10 mg dronabinol also expressed the greatest overall satisfaction with treatment (p=0.02). The figure below illustrates how the PACE Trial replicated the statistically significant primary endpoint results of the Phase 2a study. RespireRx hold the exclusive worldwide license to a broad family of patents from the University of Illinois covering the use of dronabinol in the treatment of sleep-related breathing disorders. Dronabinol also is eligible for market protection under the Hatch-Waxmann Act clause for “other significant changes” (“OSC”) exclusivity period. In addition to patents, the Hatch-Waxman provision may provide significant market protection for a branded generic formulation of dronabinol for three years. Because there are no approved drug therapies for OSA, dronabinol may be eligible for the FDA’s expedited approval process. There are four programs: fast track, breakthrough therapy, accelerated approval, and priority review. Fast track designation is typically given in the pre-clinical stage, so therefore not applicable to dronabinol. The other three pathways have many similarities and overlapping benefits, as illustrated in the table below. All four programs are designed to address an unmet medical need for a serious condition, defined by FDA as a disease or condition associated with morbidity that has substantial impact on day-to-day functioning. Regulatory steps with dronabinol. Our interaction with FDA will require a request for a Pre-IND Meeting, because we do not have an open IND. We need to get an IND number, so that we can file the end-of-phase 2 meeting request. With the Pre-IND meeting request, we submit a pre-IND package, and present the phase 2 results to FDA. One possible approach would be to request a NDA under the505(b)2 regulatory process, relying on the two completed studies. Dronabinol is safe. With an extensive safety database tracking chronic, long-term use of Marinol and generics, FDA should not have a safety issue with dronabinol in the treatment of OSA. Further, dronabinol represents a safe alternative to address the completely unmet medical need for a treatment for obstructive sleep apnea when compared to the broadening use of Sativex (which is not yet approved in the U.S.) and medical marijuana that deliver variable doses of THC in combination with countless unknown substances. Multiple development paths for dronabinol. As part of the strategic analysis of dronabinol development, RespireRx commissioned a regulatory& market assessment by Joseph Martinez, RPh of Commercialization Consulting, LLC. Dronabinol can be developed through the 505(b)2 regulatory process along two different pathways, depending on the goals and capabilities of a strategic development partner. The assessment concludes that the two clinical development strategies for dronabinol, each has advantages and disadvantages. 1. The most direct route to commercialization is to proceed directly to a Phase 3 pivotal trial using the currently available generic formulation (2.5, 5 and 10 mg) of dronabinol and commercialize a “Branded Generic” for the treatment of obstructive sleep apnea. This approach can be implemented simultaneously with the development of a proprietary dronabinol formulation (see below). ● 3-year Hatch-Waxman regulatory provision for market exclusivity and protection may be available. Using specific market access, education and contracting strategies, Commercialization Consulting estimates that it is possible to protect 85% of the real-world dispensing of dronabinol within 12 months of FDA approval of a Branded Generic Dronabinol for OSA. 2. The second strategy is to commercialize a dronabinol formulation that is currently not available as a generic drug. In this scenario, the Phase 3 pivotal trial is delayed until a new proprietary dronabinol product (dose and duration of action) is developed. Optimally, the company will develop two dose levels of dronabinol with differential drug release properties for evaluation in the Phase 3 pivotal trial for the treatment of OSA. With approved doses that are not currently available on the market, the company can eliminate generic competition and substitution. For example, 4 mg and 8 mg controlled release dronabinol formulations have no generic equivalents, so therefore cannot be substituted, even in the absence of a brand name on the prescription. RespireRx has established a clinical advisory panel (CAP) composed of experts in the field of pulmonary health, sleep medicine, and pain management. The board includes physicians and researchers from academia and industry who will advise on the development of dronabinol and advise on the scientific direction of the organization. For FDA approval and commercialization, a Phase 3 trial of dronabinol in OSA will be required. The clinical trial protocol will be written in conjunction with the clinical advisory panel and a licensing partner, however, some estimates of cost and time can be projected for budgeting and planning purposes. To that end, RespireRx estimates that the Phase 3 trial will require less than 300 patients at ~15 sites, and take approximately 24 months to complete, at a cost of roughly $12 - 14 million. The market potential for a new drug treatment for OSA is enormous, with a target market of nearly 20 million people in the U.S. alone. The original patent for the use of dronabinol for OSA is valid through 2025, so a Branded Generic Dronabinol at 80% of the price of current generic dronabinol products, and with only a maximum 10% market share, still achieves annual revenues exceeding $11 billion, as illustrated in Table 6.